Whoever wrote the script for the life of made the storyline too easy. As a high school kid Miloš entered an entrepreneurial competition with a model home he called the Strawberry House, powered entirely by green energy. The model incorporated working examples of solar, wind, biomass, and chemical cells to generate energy from renewable resources. Winning that competition helped create the momentum that continues to drive him today. “After that, me and some other students that were interested in green energy started to visit other schools and give talks to other students about it,” Miloš recalls. With this passion blossoming, and his favourite Steve Job’s quote in his head, Miloš was never going to sell the sugar water. At university, Miloš knew he wanted to make the use of green technology in everyday life a reality. 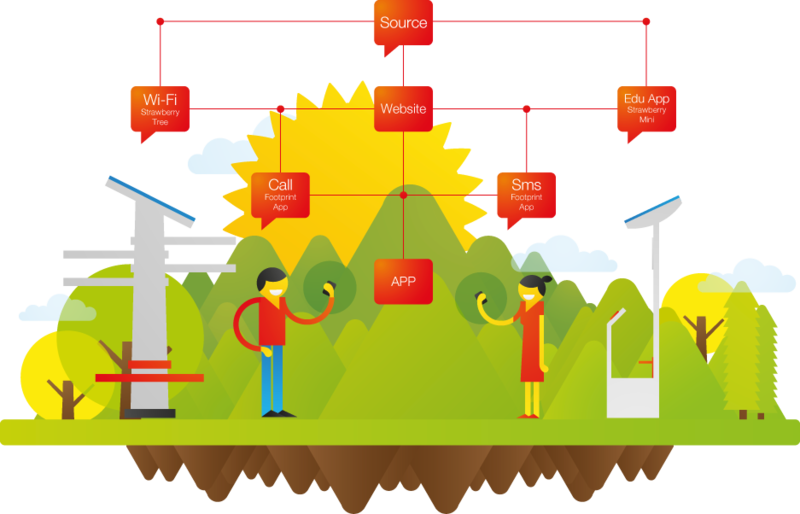 The first problem he identified was that there are two billion mobile phone users, who are increasingly relying on their devices to perform more and more functionality. He knew it was important to be able to manage the powering of a device on the go, and his solution was a solar station – pretty much the likes of a petrol station. 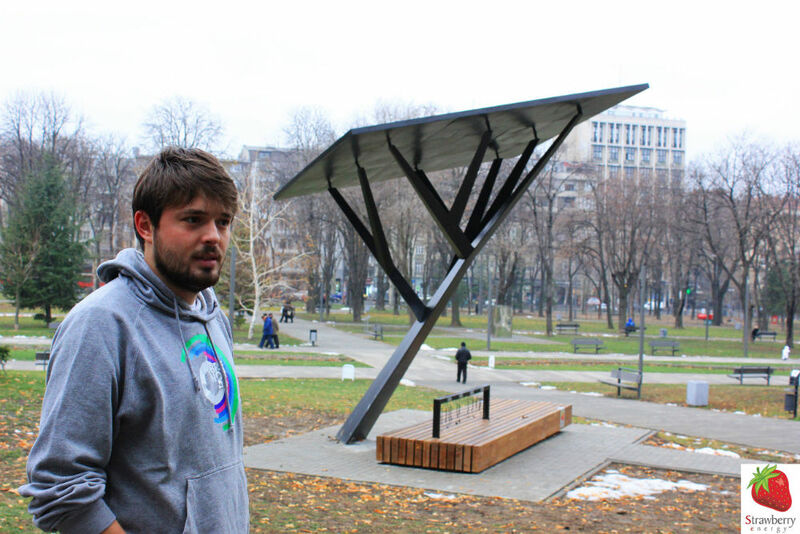 Keeping the name he used in his schoolboy years, Miloš developed the ‘Strawberry Tree’, a tree that provides 100% renewable energy – or a fake tree with solar cells on it from which you can charge your mobile phone and all your other devices. The development of the Strawberry Tree and Strawberry Energy wasn’t a spontaneous one, since Miloš was always focused on trying to make stuff and solve problems. “I develop an idea, solve issues, negotiate with partners, and then find people to sell it. It’s not a plan but a progression.” He is the epitome of an entrepreneur that thought global, and acted local. Another founder that makes it sound so simple. Miloš gathered together a team to help him realise his vision – firstly some other electrical engineering students, then someone who studied civic engineering, and finally an architecture student. After a year, the 21-year-olds had fully developed the concept of the Strawberry Tree. The tree itself is an inspiration of design, geometry, and of nature; where a real tree uses sunlight to make oxygen, the Strawberry Tree uses sunlight to make electricity. With the concept ready, the next step was to find a municipality brave enough to partner with them to build it. ”We really needed to find a municipality that had an open minded president and could see what we were doing,” says Miloš. The first deal was negotiated with Obrenovac in Belgrade in the summer of 2010 and the first tree installed in October the same year. The deal was negotiated so that the local council paid 50% upfront, and the remainder upon installation. Sympathetic suppliers agreed to a 50% upfront payment too. The day after the first one was installed, there was another request for a Strawberry Tree. As an entrepreneur Miloš seems to have a clear vision, “To educate people through practical examples, and show how solar energy can help in everyday life”. He wants the Trees to become new social hubs for people to interact with each other while they charge their device for 15 minutes. Strawberry Trees have facilitated 300.000 chargers so far, with a total time spent charging of 50.000 hours. There are 12 Trees in the ground, ten in Serbia and two in Bosnia and Herzegovina, with another 15 in the pipeline. Strawberry Energy seeks out like-minded local partners to help with distribution channels being set up in Europe, Africa and the US. 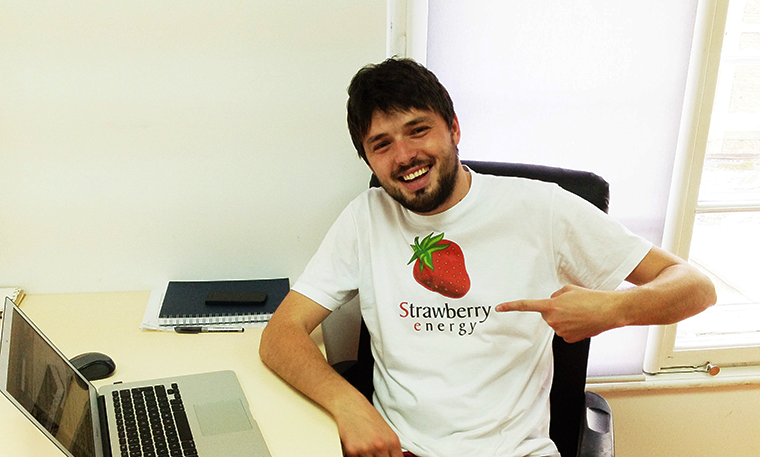 Miloš is Strawberry Energy, it is his baby and everyone else is brought on board in a paid capacity. Owning the company entirely seems to be at odds, ideologically, with what he is creating – free access to a shared natural resource. As an entrepreneur he is a big picture guy and as the responsibility of the company rests with him entirely, it would be interesting to see if its structure changes soon. At any one time, there are between 10 and 14 non-technical staff and six technical staff within the company. Sixty percent of the CEO’s time is meeting with people in the company and with external partners, the rest of his day is answering emails, reviewing designs, and organising presentations. The pattern is broken when a Tree is being installed and he likes to be on location. The cost of a Tree depends on location, design, size, and materials, and it’s somewhere between 5.000 and 25.000 euros. The standard design uses parts, which can always be reused, but there are also custom designs to adjust for particular surroundings. Naturally, the team choose eco-friendly recyclable materials, wood, aluminium and steel. 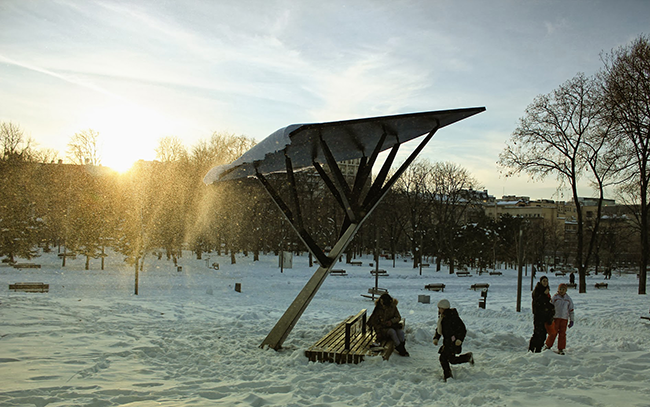 The Trees are designed to be weather proof, tailored to last 25 years in an open space, with nothing easily broken. When selling the Tree, the most common objection is vandalism, though ripping off charging cables is the only real damage they can sustain. The cables are made cheaply and designed to be easily replaced so maintenance is minimal. The one major real concern for the Tree is that it isn’t dissembled and the team have tried to make it fool proof. Being an urban installation, graffiti is inevitable, and there is a belief throughout the project that this will complement the role of the tree in matching its surroundings and becoming a canvas of sorts. 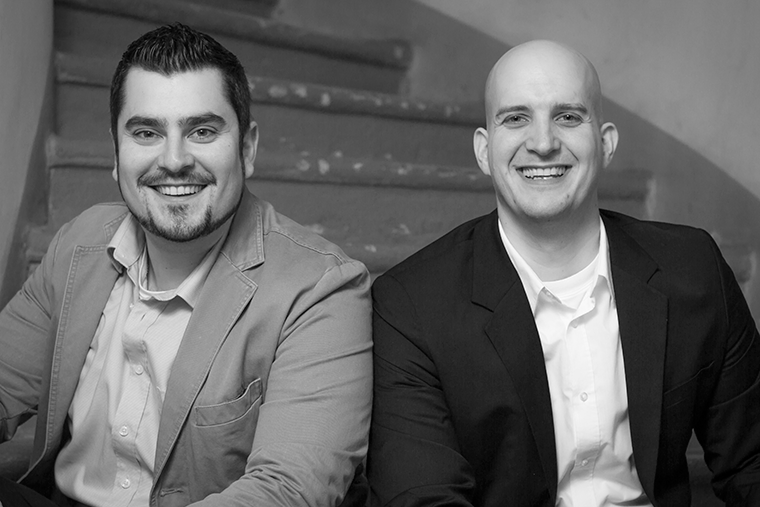 Strawberry Energy was bootstrapped entirely from their own cash (team members, family and friends). “We entered own money for the first Tree, enough to cover basic costs, and took no salaries until the first tree was in the ground.” Miloš is reluctant to give away the amount but insists it was very small with everyone donating their time and keeping the initial production process as lean as possible. 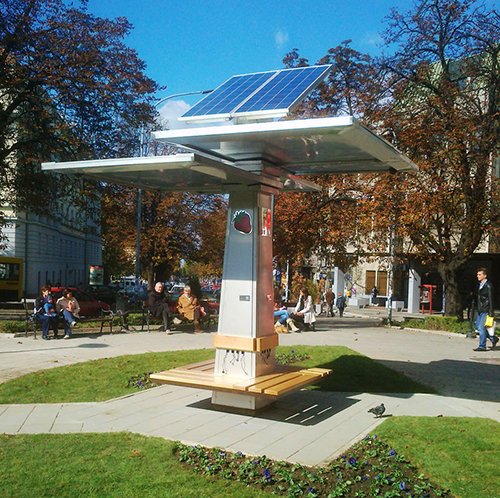 Strawberry Tree in Kikinda, Photo credit: Strawberry EnergyStrawberry Energy earns money by selling the Strawberry Tree and the other solar devices in their range – Strawberry Mini (portable Tree) and Strawberry Mini Rural (Tree in a trailer). Miloš wants to create a portfolio of green energy devices, and hinted that he may even go back and take a look at the model house for some domestic energy solutions. Strawberry Energy also generates revenue through contracts it holds to provide maintenance for the Trees, with smaller maintenance issues outsourced to a local partner.